Commercial purity iron powders were produced by using a new hydrometallurgy process. It was found that the most important factor in enhancing the purity of iron was the number of water washing process. X-ray diffraction pattern showed that the high peak purity of iron powder increased with increasing the number of water washing. The developed new methodology was based on the reaction between the aqueous ferrous sulfate and the hydrochloric acid with the presence of high purity aluminum flake. The purity of iron powders increased considerably with increasing the multi-water washing for leachate containing iron powders. The purity of iron powders was reached up to approximately 93.5%. The mean particle size distribution and apparent density for the highest value of purity are 50-100 µm and 2.85 g/cm3 respectively. تم انتاج مساحيق من الحديد باستخدام تقنية جديدة بالطريقة الميتالورجيا المائية. لقد وجد بان اهم عامل يؤدي الى تحسين نقاوة الحديد هو عدد مرات الغسل بالماء. اوضح التحليل الدقيق باستخدام نموذج حيود الاشعة السينية بين زيادة نقاوة محتوى الحديد مع زيادة عدد مرات الغسل بالماء. ان الاساس بخطوات العمل بالطريقة الجديدة المطورة هو التفاعل بين كبريتات الحديد وحامض الهيدروكلوريك بوجود رقائق الالمنيوم عالي النقاوة. ازدادت نقاوة مسحوق الحديد بصورة ملحوظة مع زيادة عدد مرات الغسل للعصارة الحاوية على مساحيق الحديد. ازدادت نقاوة مساحيق الحديد الى حوالي 93.5%. أن توزيع حجم الدقائق والكثافة الظاهرية عند اعلى قيم للنقاوة هو 50-100 مايكرون و 2.85 غم/سم3 على التوالي. In this paper, the cross section behavior of reinforced concrete columns made of normal and hybrid reactive powder concrete (hybrid by steel and polypropylene fibers) under concentric and eccentric vertical load was study. The casted columns were cured in two different type tap water for 28 days and chloride water for six months. Chloride salts with concentration was 8341.6 mg/l. Three variables were adopted in the experimental program; concrete type, curing type and the eccentricity of vertical load. Twenty (120x120x1200) mm columns were casted and tested depending on these variables. The different eccentricities were (0, 50,100 and 150) mm and where (e/h) were (0, 0.42, 0.83 and 1.25) respectively from the center of column, the other types of loading are tested the specimens as beam. The experimental results showed increasing in ultimate load capacity and higher chlorides resisting for hybrid reactive powder concrete in comparison with normal concrete in both types of curing (tap and chloride water). Through studying load deflection, test results for Normal Strength Concrete (NSC) and Hybrid Fiber Reactive Powder Concrete (HFRPC) columns that deflection for columns cured in chloride water more than tap water when compared at the same load that also by increase eccentricity leads to an increase in deflection for both cured and The neutral axis depth for HFRPC columns is more than NSC at the same load also when eccentricity increases, the compression zone decreases and neutral axis also decrease by increase eccentricity. These results occur when columns are cured in tap and chloride water. في هذا البحث تم دراسة تصرف المقاطع للاعمدة الخرسانية المسلحة والمصنوعة من نوعين من الخرسانة العادية وذات المساحيق الفعالة والمهجنة بالالياف (steel and polypropylene fiber) تحت تأثير الحمل المحوري واللامحوري , تم صب الاعمدة ومعالجتها في نوعين مختلفين الاولى في المياه العادية ولمدة 28 يوم والثانية في المياه الكلوريدية ولمدة 6 اشهر و بتركيز ( 8341.6 ملغملتر) . يتضمن الجانب العملي ثلاث متغيرات هي نوع الخرسانة ونوع المعالجة ونوع التحميل, حيث تم صب وفحص 20 عمود خرساني بابعاد (120 × 120) ملم وبارتفاع 1200 ملم. في الفحص تم تسليط ثلاث انواع من الحمل وهي الحمل المحوري واللامحوري وهي (0, 50, 100, 150) ملم ونسبة (, 0) (e/h0.42 , 0.83 و 1.25 ) من سنتر العمود والحمل الاخير هو فحص النموذج كعتبة. اظهرت النتائج العملية زيادة في الحمل والمقاومة في كلا المعالجة العادية والكلوريدية للخرسانة المهجنة مقارنة بالخرسانة العادية من خلال الحصول على منحنيات القوى-الانفعال, نتائج الفحص للخرسانة العادية والمهجنة ومن خلال الرسوم تم استنتاج بأن الانفعال للخرسانة العادية والمهجنة عند معالجتها في المياه الكلوريدية هي اكثر من الانفعال لنفس الخرسانة عند معالجتها في المياه العادية. وكذلك بزيادة اللامحورية يزداد التشوه للخرسانة. وبنت النتائج بأن عمق المنطقة الانضغاطية للخرسانة ذات المساحيق الفعاله والمهجنة بالالياف هي اكثر من الخرسانة العادية عند نفس الحمل وكذلك بزيادة اللامحورية فان منطقة الانضغاط تقل وعمق المنطقة كذلك يقل وهذه النتائج تنطبق على كلا المعالجتين العادية والكلوريدية. Normal Strength --- Hybrid Fiber Reactive Powder Concrete --- Eccentricity --- Deflection --- Curing --- Neutral Axis Depth. Free Space Optics (FSO) plays a vital role in modern wireless communications due to its advantages over fiber optics and RF techniques where a transmission of huge bandwidth and access to remote places become possible. The specific aim of this research is to analyze the Bit-Error Rate (BER) for FSO communication system when the signal is sent the over medium of turbulence channel, where the fading channel is described by the Gamma-Gamma model. The signal quality is improved by using Optical Space-Time Block- Code (OSTBC) and then the BER will be reduced. Optical 2×2 Alamouti scheme required 14 dB bit energy to noise ratio (Eb/N0) at 10-5 bit error rate (BER) which gives 3.5 dB gain as compared to no diversity scheme. The results show that using Multiple-Input-Multiple-Output (MIMO) technique represented by Alamouti scheme gives the improved BER performance as compared with no diversity (Single-Input-Single-Output (SISO)) technique.ان الهدف من هذه المخطوطةهو لتصميم منظومة للاتصالات الضوئية اللاسلكية التي تقع تحت تأثير معوقات كثيرة مثل تشتت الاشارة وامتصاصها والتأثيرات الجوية و التعامل معها من خلال معاملات رياضية خاصة مثل كاما كاما وغيرها باستخدام نوع التضمين المناسب للاتصالات الضوئية اللاسلكية.OOK. ولتقليل هذه التأثيرات تم اقتراح استخدام تقنية الهوائيات المتعددة وخاصة طريقة (OSTBC) لقد تم تحليل (BER) للمنظومة المقترحة ووجد بانه مع زيادة عدد الهوائيات لعدد محدود ممكن ان نحصل من خلاله على اشارة محسنة عند مقارنتها مع التقنيات الاخرى مثل (SISO). استخدام التقنية الضوئية للـ 2 ×2 Alamouti يحتاج 14 dB SNR عند 10-5 BER مما يؤدى الى تحسين اداء المظومة بمقدار 3.5 dB بالمقارنة مع المنظومة التقليدية. The main idea behind this paper is to design and implement a cheap, smaller size, easily operable, easy interface and flexible 3-axis Computer Numerical Control (CNC) plotter machine. The lower cost is achieved by using 2 CD drives from old PC’s with their stepper motors as the main structure for the hardware. The two stepper motors already found in the CD drives used to control the pen movements onto X and Y axis and one servo motor on the Z axis. An Arduino Uno microcontroller is used to controls the proper synchronization of these three motors during printing/drawing process. The Arduino Uno is programmed with G-Code parser from PC that is connected to the Arduino via a USB cable to control the motors movement and synchronization. The plotter machine is implemented and tested by printed different images and texts on papers (8cm × 8cm) using a pen, the small size of the papers because of the small plotter size. The motors winding voltages were displayed on the oscilloscope during the printing process to investigate the synchronization between the three motors. The design of the circuit is simple, inexpensive and can be accomplished using commercially available components.التطور السريع للتكنولوجيا وزيادة استخدام نظم التصنيع باستخدام الحاسوب بشكل خاص في الصناعات التي تتضمن استخدام الحاسوب في السيطرة على آلآت CNC وبشكل عام هذه الآلات تتطلب تكلفه باهضه الثمن، من هنا جائت فكرة تنفيذ وتصميم آله راسمه منخفضة التكلفه والتعقيد، تمتاز بصغر حجمها ومرونتها ودقتها بالعملوقابليتها للتشغيل بسهولة. يناقش هذا المشروع تطوير آلة الراسمة القادرة على التحكم بثلاث محاور في وقت واحد ليتم تحقيق اقل تكلفة عن طريق استخدام (2 CD drives) الذي يحوي كل واحد منهما على محرك خطوه واحد واخذ قاعده (CD drive from old PC) ليتم تثبيت محرك السيرفوعليه. كما يتميز النظام بتحليل G-codeوبعدها يتم تفسيره عن طريق دخوله الى الاردوينو من وصلة USB. يتم استخدام اجراءات محسنة في النظام للحد من النفقات العامه الحاسوبيه في السيطره على محاور آلة التصنيع باستخدام الحاسوب، معتجنب اي خساره في اداء النظام بشكل عام، تم استخدام اثنين من محركات الخطوه للسيطره على حركات محور X وحركات محور ،Y في حين تم استخدام محرك سيرفو نوع (Sg90) للسيطره على محور Z.النتائج العملية الرئيسية التي تم اخذها هي قياس الفولتيات على الملفات الاربعه لمحركي الخطوه وكذلك على ملف محرك السيرفو اثناء عملية الطباعة. تصميم الدائرة بسيطة وغير مكلفة باستخدام مكونات متاحه وغير مكلفه تجاريا. In this study, the analytic model (Azmi Model) had been considered for computation the load capacities of the composite open web steel joists and compared them with those obtained from experimental tests. The capacities of seven joists had been studied, each including one of the following variables (distribution of headed studs, connection degree of the connectors, inclination of the web, shape of the web, density of slab concrete, length of connectors).Theoretically, according to the Analytic model, the referenced joist of (45° web inclination , uniformly distributed ,over connected ,short headed studs) exhibited maximum load capacity of (18.45) ton, while the joist of (45° web inclination, uniformly distributed, under connected, short headed studs) exhibited minimum load capacity of (16.23) ton at yield point of bottom chord. Experimentally, the referenced joist exhibited maximum load capacity of (15.51) ton, while the joist of (34° web inclination, uniformly distributed, over connected, short headed studs) exhibited (12.49) ton load capacity. The load capacities values of the tested joists ranged between (67%-85%) of the predicted values according to the analytic model. في هذه الدراسه أَعتمد البرنامج التحليلي ( Azmi Model ) لحساب سعة التحمل للروافد الفولاذيه المركبة مفتوحة الوترات ومقارنتها مع تلك التي تم الحصول عليها من الاختبارات العملية .سبعة روافد تمت دراسة تحملها عمليا بموجب المتغيرات ( توزيع روابط القص بشكل منتظم او غير منتظم, درجة الربط لرابط القص, زاوية ميل اضلاع الجذع, شكل الجذع, كثافة الخرسانية للبلاطة , طول رابط القص). تحليليا كان أعلى تحمل (18.45) طن للرافدة المرجعية ذات الميل الجذعي (°45 ) وبرابط قص قصير منتظم التوزيع عالي الربط بينما أقل تحمل هو للرافدة ذات الميل الجذعي (°45 ) وبرابط قص قصير منتظم التوزيع واطي الربط مقداره (16.23) طن عند حد الخضوع للوتر السفلي في حين أعطت النتائج العملية قيما حملية (15.51) طن للراقدة المرجعية و (12.49) طن للرافدة ذات الميل الجذعي(°34 ) وذات رابط قص قصير منتظم التوزيع عالي الربط . تراوحت سعة التحمل العملية للروافد من ( %67 - %85 ) من النتائج النظرية بموجب الموديل التحليلي . Ethanol --- Gasoline --- Brake Power --- Fuel Consumption --- Engine Efficiency --- Emission. In this paper, the experimental thermal performance for a parabolic trough solar concentrator (PTSC) combined with helical tube receiver and directed by two axes solar tracking system at different amount of water flow rates has been analyzed. The experimental test results of thermal performance with regard to temperature rise of water, useful heat gain and collector thermal efficiency for the PTSC prototype at controlled water flow rates (2.3, 22.5 and 29.4 L/h) are collected. The results show that the increase of water mass flow rates causes decrease in the average water output temperature as (120.8, 63.82 and 46.08oC), respectively, the maximum outlet temperature becomes (160.5, 76, 47) oC, respectively, and thus, the average useful heat gain will be (1249.4, 732, 732.5W), respectively and the average thermal efficiency decreases as (73.021, 49.51 and 44.31 %), respectively. 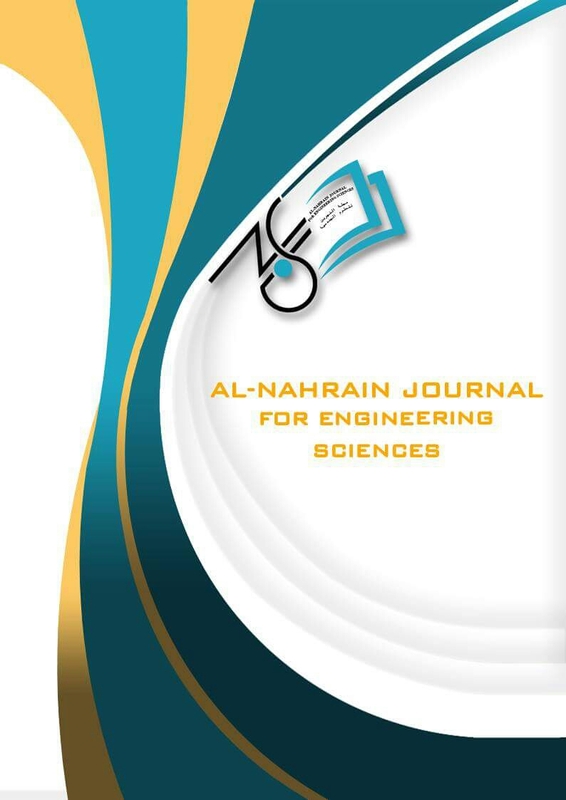 The experimental results show that decrease the water mass flow rate by 74.4%, causes an increase in the thermal efficiency of the PTSC by 64.7%.في البحث الحالي تمّ تحليل الأداء الحراري التجريبي الحراريِ للمركز الشمسيِ ذوالقطع المكافئ يضم مستلم ذو أنبوب حلزوني وموجه بواسطة منظومة التتبع الشمسي عند مقادير مختلفة من معدل التدفق الأجمالي للماء. تمّ جمع نتائج الاختبارات التجريبية للأداء الحراري بدلالة ارتفاع درجات الحرارة, الكسب النافع للحرارة, والكفاءة الحرارية للجامع في نموذج المركز الشمسي وعند مستويات مسيطر عليه تدفق المياه (2.3 , 22.5 ,29.4) لتر/ساعة. تبين النتائج بأن الزيادة في معدلات تدفق المياه تسبب نقصان في معدلات درجة حرارة الماء الخارج وكما يأتي (128.8, 63.82, 46.08) درجة, على التوالي وأن درجة الحرارة الخارجة القصوى تصبح (160.5, 76, 47) درجة, على التوالي, وبذلك سيصبح معدل الكسب الحراري النافع (1249.4, 732, 732.5) واط, على التوالي وأن معدل الكفاءة الحرارية ستقل كالأتي (73.021, 49.51, 44.31) %, على التوالي. تبين النتائج بأن تقليل معدل تدفق الماء بمعدل 74% سيزيد من الكفاءة الحرارية للجامع الحراري بمعدل 64.7%. Low Level Laser Therapy (LLLT) is one of biotechnology its useful as produced treatment for diseases that were previously difficult to treat. Some studies claim that an improvement in hearing threshold and tinnitus symptoms by Low Level Laser therapy and others set no significant effect of laser treatment. The aim of this project was to evaluation effect of low level laser (LLLT) treatment on senserinurail hearing loss. The study including 16 patients divided into two groups each group consists of 8patients (first group consist of 14 ear and second group consist of 16 ears), and each group has λ=650nm+532nm and 2.78mW/cm2. The result of this project found statistically significant differences in each group ( before and after laser application) as well as a significant change in the threshold of pure tone audiometry for patients having hearing degree (40-75)dB in each group.العلاج بالليزر أو العلاج بالليزر منخفض المستوى (ل ل ت) هو واحد من التكنولوجيا الحيوية تقنياتها لتوليد العلاج للأمراض التي كانت في السابق من الصعب علاجها. بعض الدراسات تدعي أن تحسنا في عتبة السمع وأعراض الطنين عن طريق العلاج بالليزر منخفض المستوى ، وغيرها من الدراسات لم تحدد أي تأثير كبير من العلاج بالليزر. وكان الهدف من هذا المشروع هو التحقيق في تأثير العلاج بالليزر منخفض المستوى (ل ل ت) على فقدان السمع الحسي العصبي وإذا كان بإمكان العلاج بالليزر منخفض المستوى تحسين حساسية السمعية (تغيير عتبة السمع لهجة نقية). شملت الدراسة16 مريضا. يتكون هذا البحث من جزئين كل جزء يتكون من 8 مرضى الكروب الأول 14 أذنو الكروب الثاني 16 أذن (=λ 650نانوميتر +532نانوميتر) وأظهرت النتائج وجود فروق ذات دلالة إحصائية في الاختبارات (بين قبل وبعد العلاج بالليزر) وهناك تغير كبير في عتبة قياس السمع لهجة نقية للمرضى الذين يعانون من درجة السمع (40-75) ديسيبل في كل مجموعة . Low Level Laser Therapy --- Patient Suffer from Senserinurail Hearing Loss and Pure Tone Audiomrtrey Test. One of the major usages for Al–Pb alloy are bearing alloys because of its lubricant behavior of Pb phase component. Applications of these alloys are in heavy duty, such as boring mills, presses, lathes, milling machines and hydraulic pump bushings. In present work, SiC powder was selected as additive for improving the mechanical properties of Al-Pb alloy that produced by mechanical alloying method. The percentage weight of SiC powder are (2.5, 5,10, 15 %) which mixing together with Al- Pb alloy for two hours in ball milling device, then compacted and sintering to obtain the improved alloy, and examine the mechanical properties (compressive strength and microhardness) of produced alloy . Results show that the additive of SiC powder on the Al-Pb alloy lead to improve the microhardness which increased with increased the percentage of additive, in the other hand , the compressive strength had a reverse effective with increased the percentage of SiC powder.ان الاستخدام الرئيسي لسبيكة المنيوم – رصاص هو في سبائك المحامل بسبب سلوك الرصاص كعامل مزيت للسبيكة. ان التطبيقات العملية لهذا النوع من السبائك عادة مانراها في ا لمكائن الثقيلة مثل مكائن التفريز والمكابس وبطانات المضخات الهيدروليكية . في هذا البحث تم اختيار مسحوق كاربيد السليكون كدقائق مضافة للسبيكة لتحسين خواصها الميكانيكية وتتم اضافة المسحوق لمكونات السبيكة الاصلية وخلطها بواسطة عملية الخلط الميكانيكي . النسب الوزنية لمسحوق كاربيد السليكون كانت (2.5 , 5 , 10, 15 %) حيث تمت عملية الخلط الميكانيكي على مدى ساعتين بعدها تم كبس المسحوق الناتج ثم الانتقال لمرحلة التحميص في الفرن للحصول على السبيكة الجديدة . تم فحص الخواص الميكانيكية متضمنة فحص صلادة فيكرز وفحص مقاومة الانضغاط للسبيكة المنتجة . اظهرت النتائج ان اضافة مسحوق كاربيد السليكون لسبيكة المنيوم – رصاص يؤدي الى زيادة وتحسين في خاصية الصلادة حيث تزداد بزيادة نسبة الاضافة , اما من ناحية مقاومة الانضغاط فأن تأثرها كان سلبيا مع مع زيادة نسبة مسحوق كاربيد السليكون . Al-Pb alloy --- Mechanical Alloying --- SiC Powder --- Mechanical Properties. The composite opened web steel joist supported floor systems have been common for many years. It is economic and has light weight and can embed the electrical conduit, ductwork and piping, eliminating the need for these to pass under the member, consequently eliminate the height between floors. In order to study the joist strength capacity under the various conditions, it had been fabricated seven joists composed of the steel and concrete slab connected to the top chord by shear connectors (headed studs). These joist have 2820 mm length c/c of the supports and 235 mm overall depth. In the present study, six variable parameters are adopted (Studs distribution, Degree of shear connection, Degree of the web inclination, Shape of the web, Density of concrete for slab and length of the shear connector). The test results exhibited that minimum strength capacity was 160kN for light weight joist and maximum capacity was 225kN for joist of long shear connectors at failure. The results were compared by ultimate flexural model by Azmi.الروافد الفولاذية المركبة ذات الوترات المفتوحة شائع استعمالها للعديد من السنين لاسناد الارضيات والسقوف وهي اقتصادية وخفيفة الوزن وتغطي فضاءات كبيرة ويمكن تمديد كيبلات الكهرباء وقنوات التكييف والانابيب من خلال فتحات الوترات وبالتالي نحصل على اقل ما يمكن من الا رتفاع الصافي بين ارضيات الطوابق . لغرض دراسة التحمل لهذه الروافد تحت مختلف المتغيرات تم تشكيل سبعة روافد مركبة من الحديد بطول 2820 ملم مركز الى مركز الاسناد وعمق كلي 235 ملم ربطت عليها بلاطة من الكونكريت بواسطة روابط قوى القص لدراسة التحمل وفق المتغيرات التالية ( أسلوب توزيع روابط القص studs ,درجة الربط بين البلاطة والوتر الفولاذي العلوي , زاوية ميل اضلاع الجذع , شكل الجذع , كثافة الخرسانية للبلاطة,طول رابط القص).أضهرت النتائج العملية ان العتبات ابدت اقل تحمل قدره 160 كيلونيوتن للرافدة ذات البلاطة خفيفة الوزن واعلى تحمل قدره225 كيلونيوتن للرافده ذات الرابط الطويل (50 ملم) عند الفشل.هذه النتائج قورنت تحليليا وفق نموذج عزمي . Reactive Powder Composite --- Openings --- Layers --- Deflection --- Strain --- Curvature --- Cracks --- Hybrid Section --- Strength. Brønsted Acidity --- FTIR --- Ammonia Adsorption --- Acidity of Zeolites. Diabetes is one of the most critical diseases in the world which requires measuring the concentration of glucose also the injection of insulin to control the glucose rate in the body. The proposed controller is applied to the Bergman’s three-state minimal patient model, where the model is considered certain but with unknown meal. In the present work, a nonlinear controller is designed to control the concentration of glucose based on the Backstepping approached with a sliding mode for observing the disturbance meal. So will have estimated the meal and have canceled the effect that the glucose concentration has regulating to the basal level. The effectiveness of the proposed controller, which represent the insulin dose, is proved via simulating the Bergman’s model with designed controller via MATLAB Simulink software. The result clarify the ability and the robustness of the proposed controller. يعد مرض السكري من أكثر الأمراض خطورة في العالم والذي يتطلب قياس تركيز الكلوكوز وأيضاً حقن الأنسولين للتحكم في معدل الكلوكوز في الجسم. يتم تطبيق مسيطر مقترح للتحكم بنموذج المريض الحد الأدنى الخاص بموديل ببركمان بثلاث حالات ، حيث يعتبر النموذج مؤكد مع وجبة غير معروفة. في العمل الحالي ، تم تصميم وحدة تحكم غير خطية للتحكم في تركيز الجلوكوز أساسا هو مسيطر تراجعي خطوة بخطوة مع المخمن المنزلق لتخمين الاضطراب (الوجبة). لذلك بعد أن يتم تقدير الوجبة ، يتم إلغاء التأثير ويتم تنظيم تركيز الكلوكوز على مستوى الكلوكوز قبل الحقن القاعدي. أثبتت فعالية وحدة التحكم المقترحة ، والتي تمثل جرعة الأنسولين ، عن طريق محاكاة نموذج ببركمان مع وحدة تحكم مصممة عبر برنامج MATLAB وتوضح النتيجة قدرة ومتانة وحدة التحكم المقترحة. Backstepping Controller --- Sliding Mode Controller --- Sliding Mode Observer --- The Chattering.